Despite the name, our technicians can do much more than tend to the air ducts of your home or business! We can also take care of things such as the kitchen exhaust hood in restaurants, air quality testing, and other important services. Which are the most likely reasons for needing to give us a call? Take a look below to find out! 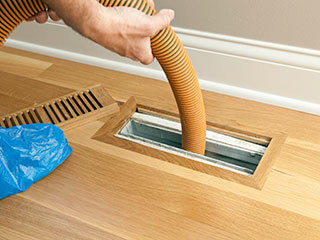 While we can take care of more than just air ducts, it is also one of the most likely reasons to call. Periodic air duct cleanings can do a lot for your home and those inside it, like lower energy spending as well as improve the quality of the air. As your ducts draw in air to be dispersed through the home as heating or air conditioning, dirt and other substances are also brought in and build up. These clogs slow down the air flow, hence wasting energy, and also contaminate the air. This can be a big problem for anyone with allergies or a breathing condition like asthma, but a cleaning will help ease these issues. Dryer vent cleaning is of particular importance because it helps to prevent the risk of fire in the home. Lint and other materials that get stuck in the vent of the dryer over time can begin to burn due to the high temperatures used to dry your clothing, and this can start a fire. Getting the vent completely cleared out by a trained technician every now and then will reduce this risk, and also helps with preventing energy waste as well. Professional air duct services can provide repairs and replacements various ducts and vents around the home, such as for the air or dryer systems. The air ducts falling into disrepair tend to be particularly noticeable because they usually make a lot of noise when the air is running, as well as potentially causing foul odors to come from the vents. Energy costs may rise thanks to air escaping from a break in the duct, and it may also funnel in air from closed off sections of the home, hence the bad smell.